​The island of Skyros is today a relatively sparsely populated island found in the Aegean Sea, northeast of Euboea. Skyros is though, an island which had appears in Greek mythology, for it was the place where Theseus met his death, and also it was home to Achilles prior to the Trojan War. ​Many prophecies were uttered about Achilles before the Trojan War; for it was foretold that he would be greater than his father Peleus; that he was destined to either live a long and dull life, or a short and glorious one; that he was destined to die at Troy; and lastly, Calchas foretold, that the Achaeans could not win unless Achilles fought alongside them. Achilles was born in Phthia and tutored by Chiron upon Mount Pelion, and yet by the age of nine, it was said that the son of Peleus and Thetis was found on the Aegean island of Skyros, and of course there is tale told of how Achilles found himself upon Skyros. This tale is not to be found in Homer’s Iliad, but can be found in Statius’ Achilleid. Peleus and Thetis had gone their separate ways after Thetis had failed to make her son Achilles immortal, and Achilles had been left in the care of Peleus, who then gave his son to Chiron to be taught. Thetis though had not abandoned her son, and with the ability to see into the future, Thetis could see her son dying at a young age at Troy. Thetis though would seek to change the future, and planned so that Achilles would not go to Troy, and if Achilles did not go to Troy he could not die there. So, Thetis would take Achilles from Chiron and transported him to the small island of Skyros, which at the time was ruled by King Lycomedes. Furthermore, Thetis decided to disguise Achilles as a girl, so that he might be hidden amongst the seven daughters of King Lycomedes. The youthful Achilles protested about having to disguise himself as a girl, but when he observed the beautiful Deidamia, Achilles was said to have changed his mind. 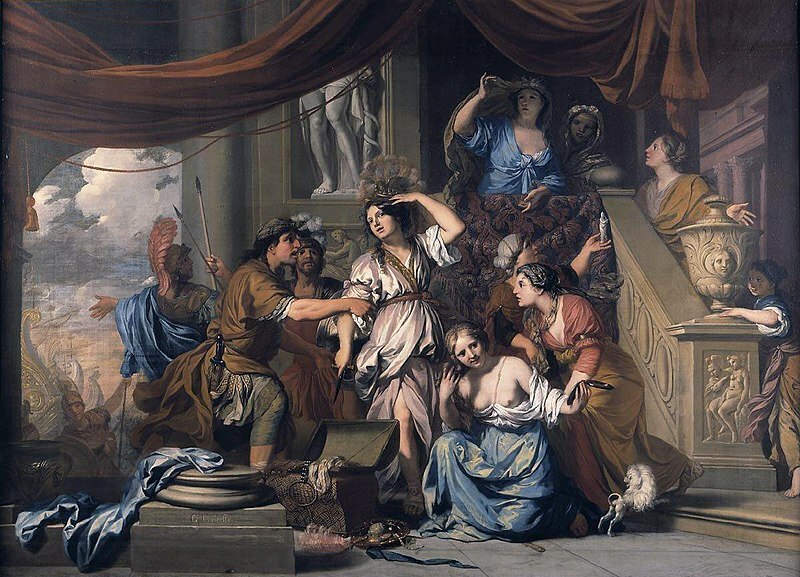 Thetis thus presented Achilles to Lycomedes as if her son was actually her daughter, named Pyrrha, and requested that she might live amongst the king’s daughters. The reason for this, given by Thetis to Lycomedes, was the fact that Pyrrha needed to learn feminine ways, having previously only been exposed to an Amazon style way of living. The deceived Lycomedes willingly accept Achilles/Pyrrha into his home. ​Living alongside the daughters of Lycomedes, Achilles would fall more and more in love with the beautiful Deidamia, and eventually Achilles revealed himself to Deidamia. Deidamia would subsequently fall in love with Achilles, although she did not reveal his identity to anyone else. At some point Achilles and Deidamia would be secretly wed, and Deidamia would give birth to a son for Achilles, a son named Neoptolemus. ​Away from Skyros events were occurring that made a war between Greece and Troy inevitable; and as Agamemnon gathered together forces to retrieve his sister-in-law Helen from Troy, the seer Calchas reiterated a prophecy which said that the Achaeans could not win unless Achilles was with them. Agamemnon would dispatch other Achaean leaders to seek out Achilles. Guided by Calchas, several Achaean leaders would arrive at Skyros; Odysseus was certainly amongst the number but whether he was joined by Ajax the Great, Diomedes, Nestor or Phoenix depends upon the work being read. ​Some tell of how Achilles would have immediately revealed himself, but was held back from doing so by Deidama. 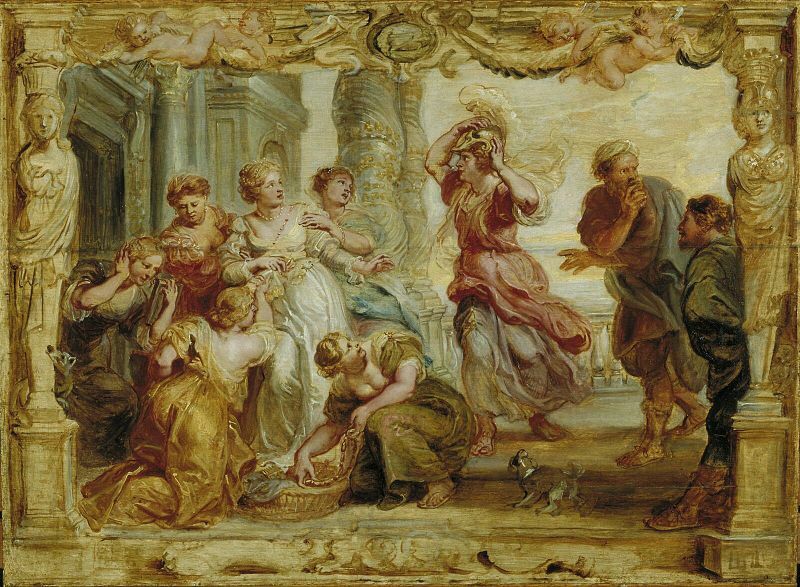 Odysseus was convinced that Achilles was hidden within the royal court, and so using his renowned cunning, Odysseus decided to trick Achilles into revealing himself. There are two versions of how this trick was implemented. The first version tells of how Odysseus presented, in two baskets, gifts to the daughters of Lycomedes. In one basket were jewellery and trinkets, and in the other were arms and armour. 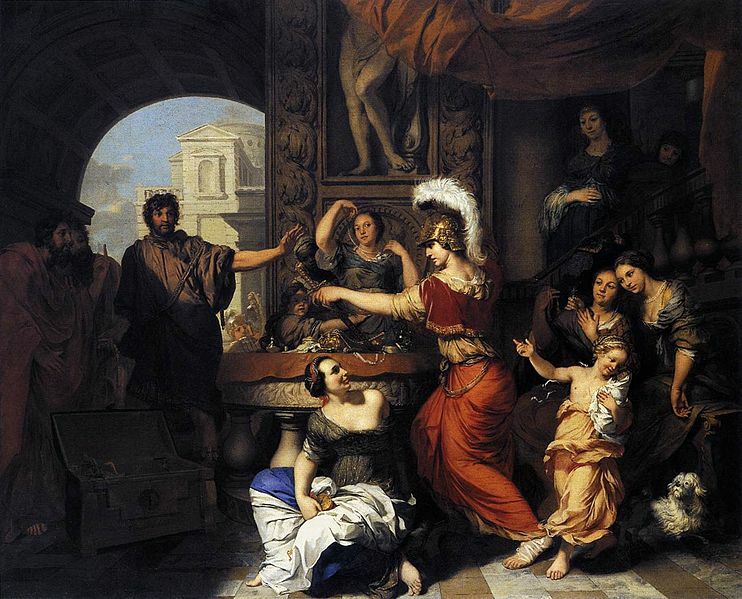 The real daughters of Lycomedes went to the basket of trinkets, whilst Achilles alone went to the basket of weapons. Alternatively, Odysseus had his Achaean comrades simulate an attack on Skyros, and when a warning horn was sounded, Achilles forgot his disguise and took up weapons to defend the island. In either case, Achilles had revealed himself as a warrior hidden amongst the princesses. Achilles now has to depart from Skyros, leaving Deidama behind. Achilles though promises to return, but of course he doesn’t. ​Now some say it is unfitting for so great a hero as Achilles to have hidden away amongst the daughters of Lycomedes, and so an alternative tale is told of how Achilles came to be upon the island of Skyros. In this version, Achilles, though still young, had developed into a military leader, and had been given the job of conquering the island of Skyros by his father Peleus. Presumably because Peleus sought vengeance upon Lycomedes, the king blamed for the death of Theseus. The island of Skyros was said to have easily fallen to Achilles, and imprisoning Lycomedes, Achilles had taken Deidama as his wife. Thus it was a conquering Achilles who was found by Odysseus upon Skyros, and Achilles willingly joined the Achaeans for the impending war against Troy.